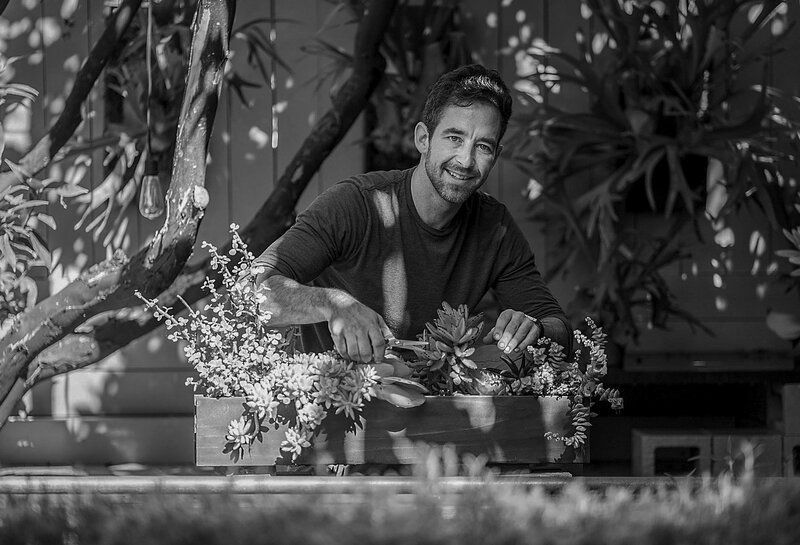 For our Secret Lives of Seven San Diegans feature, get to know Ryan Benoit, an engineer who cultivates his creativity by blending his passion for plants with his skill for design, carpentry and invention. 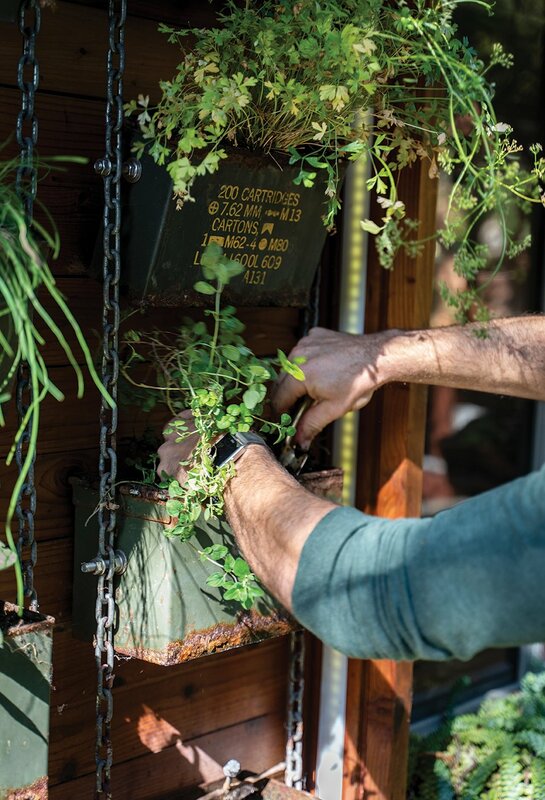 If you see a bunch of tin military ammo boxes at Ryan Benoit’s La Jolla cottage, you can bet he’s not using them to keep his firepower dry for the next time he goes hunting. 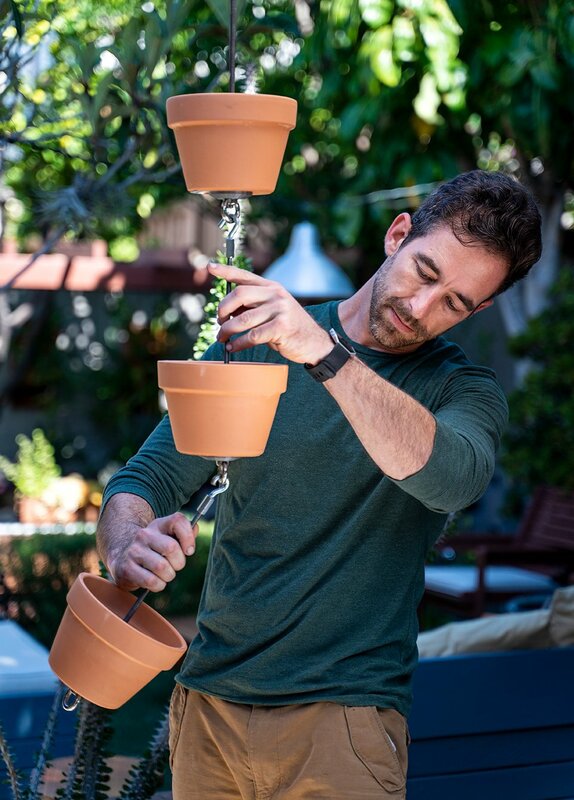 Instead, he rigs them vertically on heavy-duty chains, fills them with soil and his favorite herbs, attaches them to the exterior of his house (it’s a rental so he’s built a shell of wood around the stucco), adds lighting and, voilà, he’s got a statement planter. But that’s not Ryan’s point. He’s too young to have experienced the “Make Love, Not War” era. At his age, the relevance is recycling. 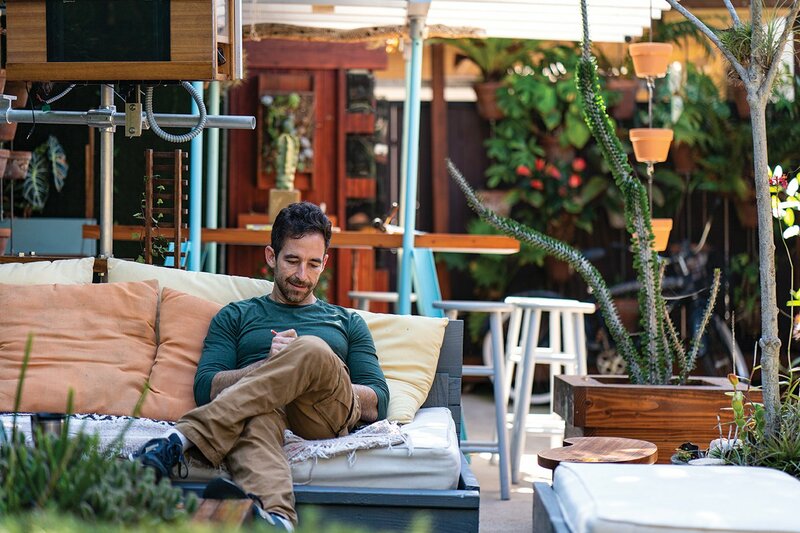 His smallish backyard, lush with his creativity, looks like an experimental garden dappled in plant- and patio-furnishing inventions. Right-brained and left-brained, Ryan’s engineering, mathematical side can’t keep up with the innovative ideas that fire off at, let’s guess, a million miles a minute. A futon Ryan Benoit fashioned provides a comfy spot to sit and get his ideas down on paper. Ryan smooths the finish on his living coffee tables. Ryan dabbled in photography, shooting plants as a hobby for a while to keep his artistic juices flowing. 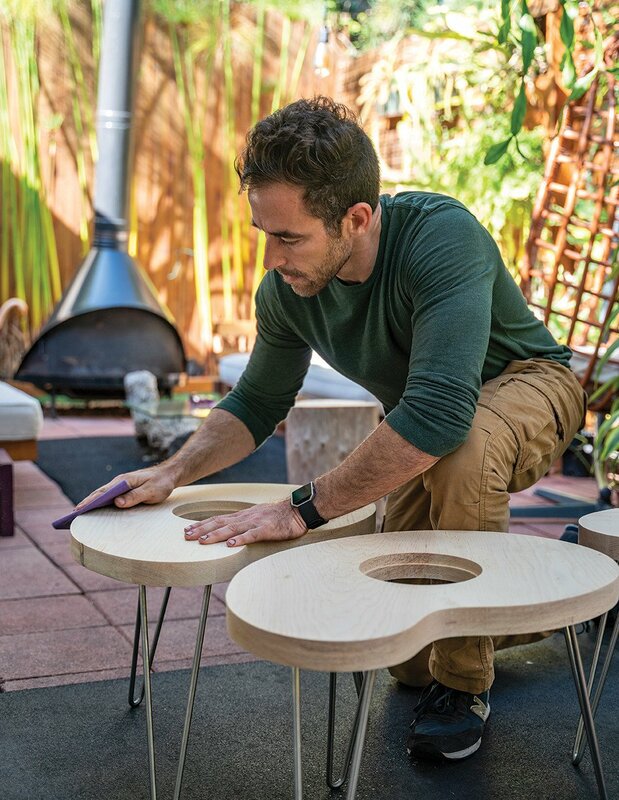 But his true creative niche came clear when he decided to transform the rental’s concrete-slab of a backyard into a fabulous outdoor space—starting with his living tables. Ryan demonstrates the hanging system of his vertical clay pots. 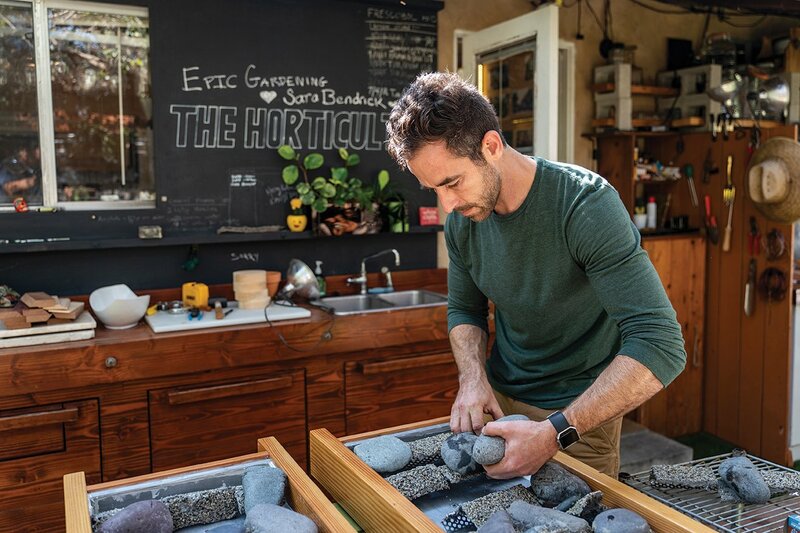 The horizontal tables are a hit in the backyard, but with a space of only about 1,700 square feet, revamping the outdoor room into a flourishing Eden required that most of Ryan’s planter creations be lateral. He fashioned a grid with inexpensive copper pipes that serve as trellises for passiflora edulis. Air plants fill a wire mesh trellis that he made from single paper-welded wire lath with 2-inch square grids that he bought for a song at The Home Depot. The trellis hangs from a limb of a guava tree. 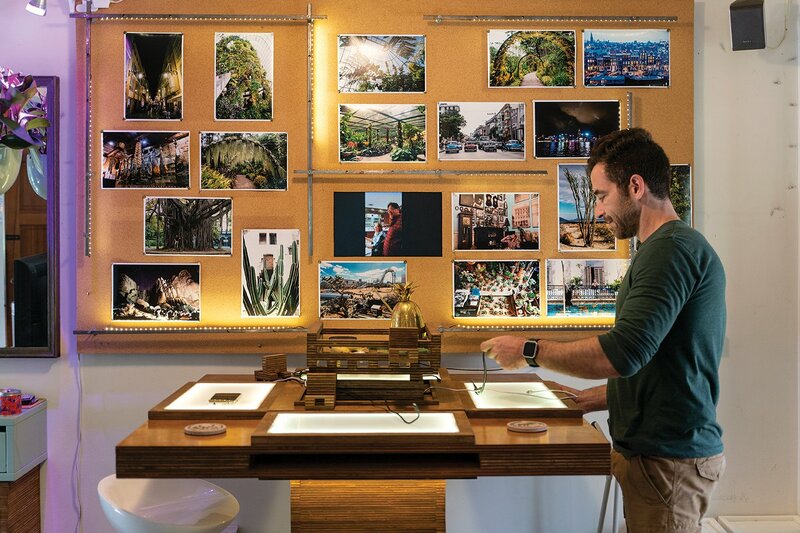 Ryan works on a living wall design for Bird Rock Coffee Roasters. Some of Ryan’s other inventions use plants as an aside bonus. A theater screen hides behind a trellised frame topped by a Costa Rican butterfly vine above a rosemary bush—“my aromatherapy spa,” he says. The projector’s hookup for the outdoor theater has a secret home too: beneath the living coffee table’s planting bed. If evenings are chilly, there’s a Robot Heater—a weird contraption on wheels that looks like it came from The Jetsons. Ryan made the gadget from a propane tank and some tubing and then added a little wood for a tray table. Indoors, the living kitchen table is alive with more than plants. A medical actuator that Ryan purchased at a surplus store turns this ordinary plywood furniture piece into a telescoping utility table at the push of a button. Ryan added electrical outlets that hide underneath the centerpiece (a planter or fruit basket) and match-the-table cell-phone holders that attach to the centerpiece and stand upright. Plus, the placemats, hidden in slots at each seat, are LED. But don’t look for these tables at Bird Rock Coffee Roasters any time soon. Casino slot machine frames light up a photo wall behind a futuristic high-tech dining table invention.